Long sitting hours on workstation are bound to induce back pain problems. Most software guys tend to be victim of back and neck pains. In an effort to keep myself fit, I have been trying a lot of things. Though none of the following is a guaranteed solution, commitment and regularity can help you stay healthy. This is my latest fitness fad. Value for money solution, that works wonders. Yes, the Exercise Ball is useful as an alternate sitting solution. This is a natural healer to the back ache. Reason it works is back automatically stays in shape while sitting on it. When you try to move a bit front and back in order to maintain balance, it actually heals your back. At first look, you may think it is tough to balance yourself on the ball and simultaneously work. I also had this doubt which got over in first two days of using it. You can start using it for half hour a day initially. Then gradually increase it to 2-3 hours a day. You can shift to normal chair for the remaining time. I checked with a local physio, who confirmed it is one of the best healing chairs you can buy yourself. Some companies like Gaime even have a ball chair solution. I have not got to try it. Following are the opinions of my colleagues and friends who are also using this unique chair. 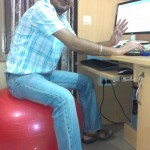 I don’t think any chair would be more comfortable than Gym Ball if someone has to sit and work all day long. My back pain is gone. Can sit on it straight for more than 3 hours. It gives some relief to back pain if you use it in short time intervals. It even helps for proper blood circulation to legs. It is not advised for long time intervals as it is difficult to balance the ball. I tried for Ball Chair and it is not available here in Hyderabad. Yoga Asanas are help bring flexibility. Following link can be taken as an example. As per my experience, yoga works, but daily routine needs to be followed. Also, Yoga brings about flexibility but cannot gurantee freedom from back ache due to long sitting. This is about famous 90 degree posture. Everything needs to be in perfect angle while working on computer. In a session with a physio visiting our office in my previous company, I was introduced to office exercises. One is recommended to do these exercises twice a day sitting in the office. Example link is given below. I found shoulder shrug, neck exercises, arms stretching are easy to follow and helpful. Herman Miller Chairs or others of the like. Some truly nice and utilitarian information on this site, as well I conceive the style and design holds wonderful features. Thats really a unique thing. Never heard of it before.